The Association has been invited to attend the new squadron stand-up parade at RAF Lossiemouth at 1100 on Thus 2 May 2019. Members are also invited to a lunch, open afternoon and formal dinner on the same day. Members who wish to attend are requested to contact the Assn treasurer, Paul Lenihan on leanman21@hotmail.com. You are more than welcome to make your own travel arrangements, but Leanman is looking to book a coach from Lincoln to Elgin dep 1 May and return on the 3rd. He is also looking to block book a local hotel for the weds and thus evening: there is a possibility that external funding may offset the cost of travel and hotel accommodation, but this will be wholly dependent upon members registering their interest by the end of Jan if they wish to travel to the event via coach. I am pleased to inform you that IX(B) Sqn Assn Members have been invited to the Tornado Disbandment Hangar Party at RAF Marham on 28 Feb 19, as well as the Disbandment Parade at RAF Marham on 14 Mar 19. If you are interested in either of these events then please email me direct (association.sec@9sqn.co.uk) and I will pass on to you the relevant contact details. Please note, these invitations are for Assn Members only. 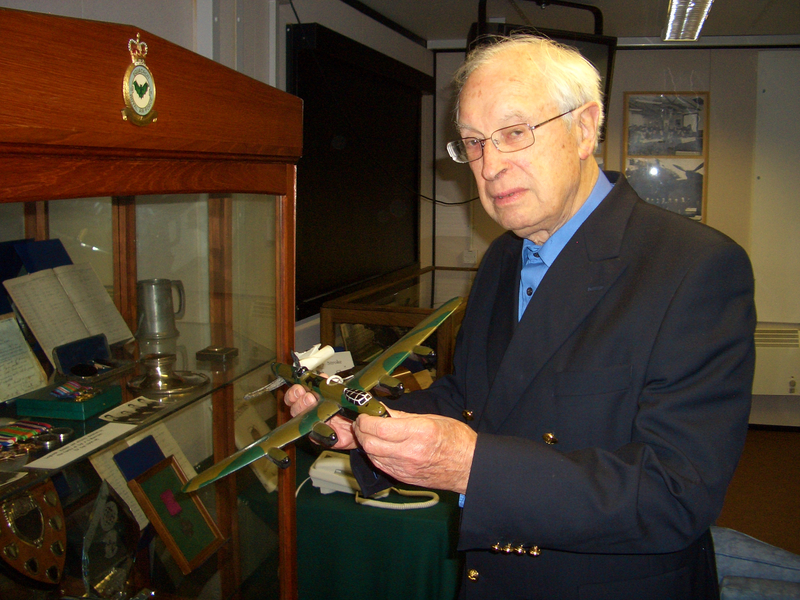 Mac was born in Scotland on 28 May 1922 and joined the RAF in 1941, aged just 19. He was posted to Newquay for Basic Training and Pilot Ground School. He was then given 10 hours of Pilot aptitude testing in a Tiger Moth. He passed selection and was sent to No 5 BFTS in Florida for training. He started flying the Stearman PT17s, then graduated to the Harvard. He passed out successfully and returned to the UK to continue training on the Oxford. He was then posted to the Operational Training Unit at Silverstone to learn to fly the Wellington. Over 100 aircrew were huddled into a large room and told to crew up and proceed through the exit door to give crew names once they had a full crew. Mac knew it was essential to have a good navigator and saw an intelligent looking chap sitting quietly in the corner. The Navigator had left studying for a Science degree at Oxford to join the RAF and had qualified ahead of all his peers. Mac bagged him and then a bomb aimer, Wireless operator and two air gunners. They were now a crew, all acting Sergeants and all very young. On one sortie toward the end of the course, after takeoff, the Wellington was vibrating very badly and Mac couldn’t get any more speed from her. He had a bracket of less than 5 kts between his current maximum speed and stall speed. 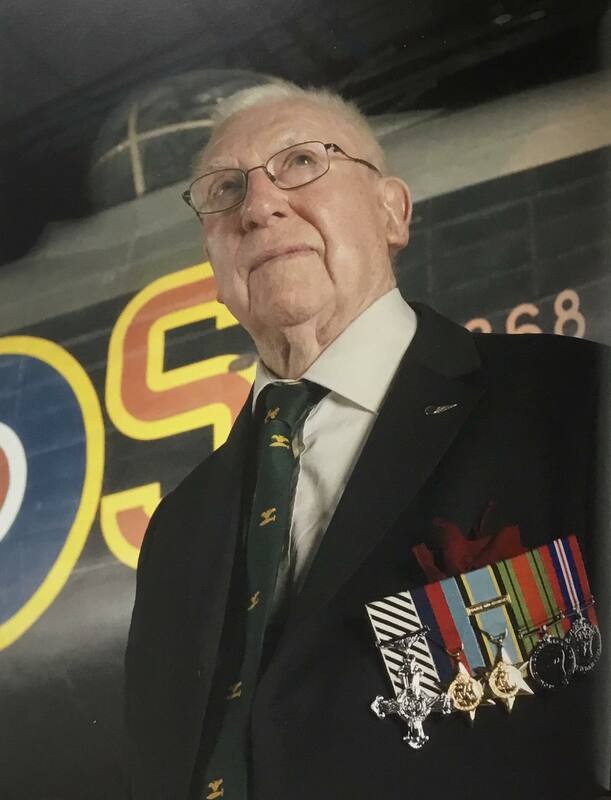 Very skillfully, with the help of the whole crew, he landed, to find out that they were the only known crew to have survived a Wellington flight with 2 wing fuel covers undone. 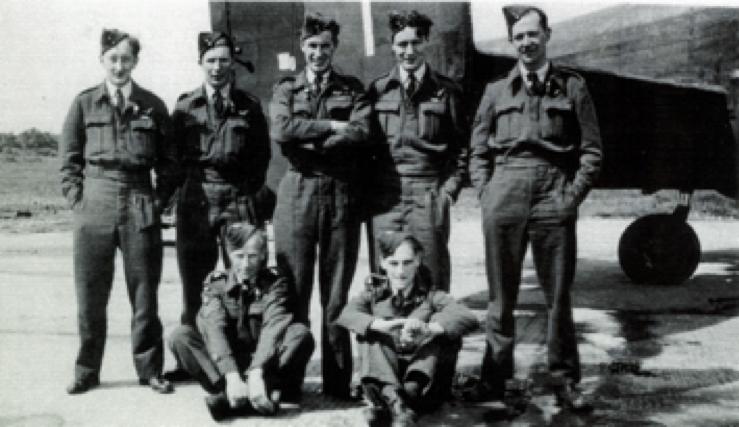 The airframe fitter who had forgotten to secure them was charged and Mac was congratulated by the CO.
Mac’s crew were then posted to the Heavy Conversion Unit at Wigsley to fly the Stirling for a month, they were then declared “combat ready” and were posted to IX(B) Squadron at Bardney, Lincolnshire. Mac’s crew, under his exceptional leadership, went from strength to strength and were soon formation leaders, pathfinder leaders and windfinder leaders. Mac’s crew successfully flew all 3 TIRPITZ raids. Other attacks included sinking a destroyer in Gdynia Harbour, 3 dams, 2 oil refineries, 4 viaducts, 3 bridges, 3 submarine pens, 1 ammo dump, 2 flying bomb sites, 2 cities and finally, hitting Adolf Hitler’s home at Berchtesgaden on 2 April 1945. 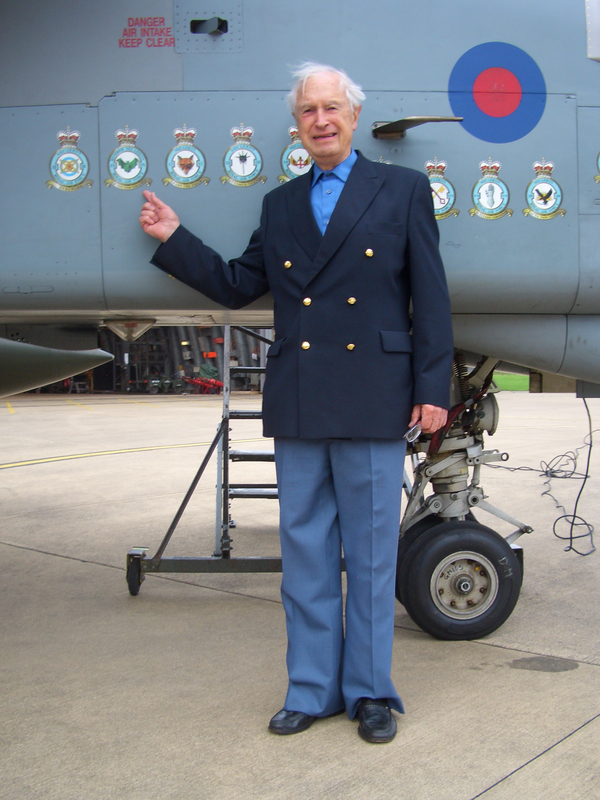 Mac completed over 40 operational missions, was commissioned and awarded the DFC. At the end of the Second World War, Mac got himself onto a RAF Transport Command Conversion Course by bribing a WRAF Corporal with some stockings. Having converted to transport aircraft, he left the RAF with many happy memories and joined BOAC, then British Airways. He was a Captain on Comet 1s, Boeing 707s then Boeing 747s for over 30 years. 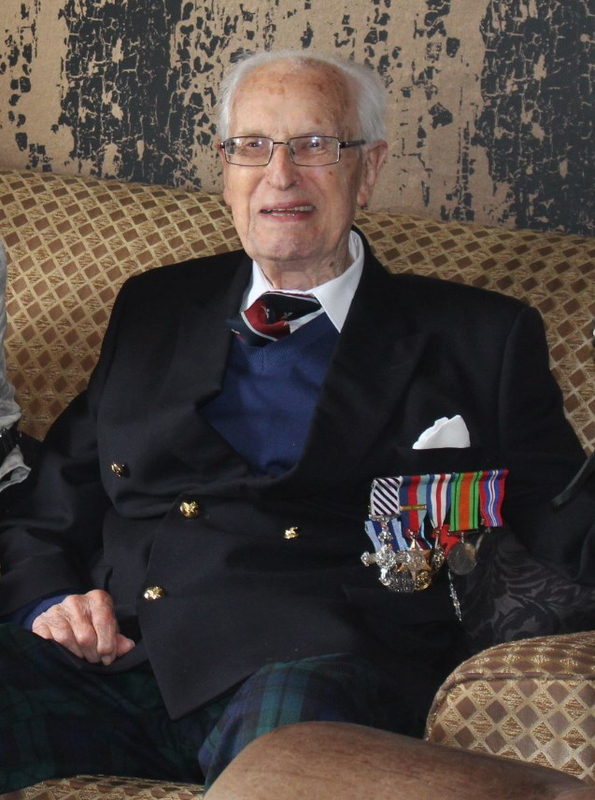 Captain Donald MacIntosh DFC was awarded the Chevalier de l’Ordre National de la Légion d’Honneur in 2015 and died peacefully in Crieff on 10 January 2019. Mac’s Funeral will be held on Wednesday 23rd January, 1200 noon at Crieff Parish Church, 21 Strathearn Terrace, Crieff, PH7 3AQ, then at Perth Crematorium at 3 pm at Crieff Rd, Perth, PH1 2PE. Please see the attached documents which are, specifically, a copy of the minutes from the AGM that took place at RAF Marham during the reunion weekend last year as well as a copy of the Agenda for this year’s AGM which will also take place in the Officer’s Mess, RAF Marham from 1100hrs. All members are invited to attend and there will be tea and coffee provided from approx 1045hrs. Your Committee look forward to seeing as many of you as possible during the day. All members are requested to view the completed accounts for the financial year 2017/2018 (Currently in the AGM section of the Website). Those members attending the AGM will be asked to ratify them as a true and accurate statement of the year’s activities. For those not attending the AGM, please can you can direct your questions on the accounts to the Association Treasurer. Please see the message below, sent out in an email to all members recently. It would appear that not everybody had visibility of this so I’m publishing it for you here. If you are interested in attending, please contact Alfie Ferguson or myself. Four years ago when we completed a most enjoyable 3 day trip to St Omer to celebrate the 100th anniversary of the formation of IX(B) Squadron (there were about 120 Association members involved in support of serving Squadron personnel), I vowed never to take on something of that nature again. At my mature years I should have known better … never say never … so here we go … again … but on a smaller scale. This year, as we know, the Royal Air Force is celebrating the 100th Anniversary if its formation in 1918, and in recognition of the link with the RFC/RAF in those early days, the St Omer Town Council (with some St Omer Flying Club involvement) has written to the Chief of Air Staff to formally request RAF involvement in a celebration that acknowledges the 100 years + link. I have to say at this stage that without a significant “push” from our Nick Hay, Chairman of the IX Sqn Association, this would not be happening. As a serving 1* he has been able to lean on the RAF 100 Programme Team to include this event as part of the wider celebrations. Believe me it was not straightforward, but fortunately Nick has a low key day job and plenty of spare time. As a result, we do now have agreement for some regular RAF involvement, and in particular from the two Squadrons that were formed at St Omer (IX(B) and 16) plus 41 Sqn which flew from St Omer in 1916 and which has the double-armed cross on their crest that also appears on the St Omer town’s arms. I mention the three squadron link to make it clear that on this occasion the event is not a dedicated IX(B) Squadron celebration. The main event, which is planned for Thursday 20th September 18, will involve serving personnel from all 3 squadrons (to an extent that has yet to be finalised) and the 3 Squadron Associations. I have yet to speak with 16 and 41 Squadron Association project leads. but I am expecting the IX(B) Squadron Association’s involvement to be significantly greater than the other two – no surprises there when looked at against our remarkable Association strength and commitment. One coach this time for about 40 Association members rather than the 2 that we arranged in 2014. This can probably be expanded to 50 if needs be. Leave from the Imperial War Museum, Duxford, at 0900 on Wednesday 19th September 18. Car parking will be made available as per the last occasion. One pick up point en-route to Folkstone for rail tunnel crossing. Thurrock Services was successfully used last time. Negotiable for best option. Travel to Folkestone to Calais on the 1220 train. Arrives in France at about 1400 local time. To hotel (more of that later) to check in at about 1500. Travel from Calais to Folkestone on Friday 21st September to catch the 1650 train, arriving in Folkestone at about 1630 UK time. Drive to Duxford via the same stopping off point. Friday travel on UK roads not ideal … sorry but not our choice of dates. Plan for 1800 evening visit to Chapel of the Jesuits, St Omer to see Exhibition entitled: “1918-2018 RAF, born in St Omer”. With English speaking guide. 2000 Dinner in Chateau Tilques. St Omer. AM Guided visit to La Coupole, a huge bunker that was built by the Germans as a V2 launch site. The bunker was bombed successfully by IX Squadron Lancasters, but despite our best efforts it remains remarkably well preserved! In 1977 it was turned into an impressive history and museum centre. Lunch on site. PM St Omer Cemetery: Wreath laying and start of official ceremony. PM St Omer Airfield: Further ceremony at RAF Memorial at St Omer + displays + flypast planned + local orchestral concert + unveiling of plaque to commemorate the event. Reception. Dinner in Chateau at 2000. tbc depending on nature and content of “reception” planned by our St Omer hosts. 1030 (option 1) Visit Tyne Cot Commonwealth War Graves Cemetery. In Zonnebeke, Belgium. An hour or so from St Omer, but hugely impressive. Two nights in Hotel Chateau Tilques – DINNER + bed & breakfast in a twin or double room is £279 per person. Single supplement £60 per person. I have a firm “reservation” for 20 twin/double rooms at Hotel Chateau Tilques until 16th May 18. However, that’s the absolute cut off date, and to sort out the other arrangements for this trip, such as payment, can I ask you to let me know if you would like to join the latest IX(B) Squadron travel extravaganza NOT LATER THAN WEDNESDAY 9th MAY 18 – even sooner if possible? Finally, bearing in mind the huge number of email addresses that this message has been sent, please don’t feel the need to “regret” the invitation to join the group. I just need to know who would like to go based on the information that I have gleaned so far – there will be some changes but hopefully not significant – and I will assume “not interested” if nothing hear by 9th May 18. Association members are reminded of the AGM to be held at the Officer’s Mess RAF Marham at 1100 on the 23rd September. The Agenda for which can be found in the AGM section of the website. Members are requested to read the Financial report for 2016/17 and the financial plan for Financial year 2018/19, which are also in the AGM section: members will be requested to ratify both documents at the AGM. All, please see the minutes of the AGM which took place on the 23 June 2017.